Rieti: Powell 9.77, Burka 4:18.23, Lagat 3:32.75!! "After seven races in five days I'm a little tired. Now, I'm going on vacation." - Asafa Powell after running 9.77 and 9.82 in Rieti, Italy. Asafa Powell's World Record Attempt Comes Up Short As Does Tirunesh Dibaba's As Bernard Lagat Shines in 1,500 and Gelete Burka in Women's Mile The meet in Rieti was strong as usual. Powell showed he meant business as he ran a 9.77 in his heat, and many were wondering if he could get the world record in the final. 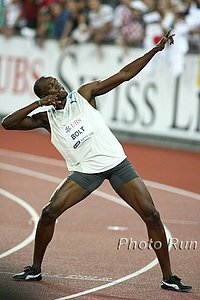 But once again, when the pressure was on, he actually ran a bit slower (9.82). How in God's name did that guy not win an Olympic medal? Double Olympic champ Tirunesh Dibaba was on world record pace through 3k but came up short (14:23). American Bernard Lagat showed he's over his injury woes as he crushed the field in 1,500 winning by almost two full seconds as he ran a seasonal best of 3:32.75. On the women's side, Gelete Burka made up for her own Olympic disappointment by running a stellar 4:18.23 full mile to beat Jamal (4:19.50) and Shannon Rowbury (4:20.34). *Powell Comes Up Short In World Record Attempt in Rieti: Powell "After seven races in five days I'm a little tired. Now, I'm going on vacation." *Will $50,000 For World Athletics Final Winner Entice Powell To Change His Mind About Going on VacationHim To Change His Mind?